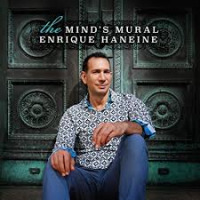 Drawing from influences as diverse as his Latin heritage, Middle Eastern rhythms, and the sounds of New York life, Grammy-nominated drummer/percussionist and pianist Enrique Haneine fashions his latest, The Mind's Mural, into a totally accessible free-form session that is both easy and challenging to the ear. 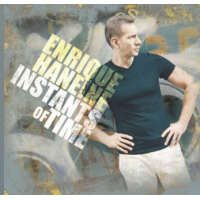 A vibrant pianist, Haneine, as he did on the eye-opening Instants of Time (Elegant Walk Records, 2016), holds his drummer's chair and situates the lyrical dual saxophones of Anna Weber (tenor) and Catherine Sikora (tenor and soprano) as the main conversationalists while he and bassist Carlo de Rosa power the dialogue. Within this inventive setting all manner of engrossing discourse and argument can be heard within these eleven, intriguing, tightly wound Haneine originals. It is the space between the beats that holds Haneine's interest fast, and it affords his players a level of freedom not experienced with strict-time drummers. Like confident co-conspirators, Weber and Sikora begin free blowing in tandem on "Once A Thought," bobbing and weaving around the meter and each other's many taut angles. "The Seventh Layer" unravels with a persistent calypso drive. "Hidden Mirrors" is a remarkably dark rhythmic force, the saxophones at first dervishes around the bossa-nova, then solo out with a snake-charmer's insistence. Throughout, de Rosa is the connective tissue, picking up beats Haneine intently drops, holding Weber and Sikora in line or letting them run fast and free. Thus, "Reality Shape" becomes the perfect free-jazz vehicle with the bassist as its anchor. "Like A Bronco" is another driving highlight. Haneine may not be a jazz presence that turns many heads, but The Mind's Mural goes a good distance to correcting that. Track Listing: Once a Thought; The Seventh Layer; The One Eleven Take; Just Because; Motionless Passage; Hidden Moments; Reality Shape; Like A Bronco; While You're Away; Life of It's Own; Komet.